Castor-oil-plant, a.k.a. ricinus communis or castorbean, is a species of perennial flowering plant in the spurge family, Euphorbiaceae. Castor oil has many uses in medicine and other applications. An alcoholic extract of the leaf was shown, in lab rats, to protect the liver from damage from certain poisons. 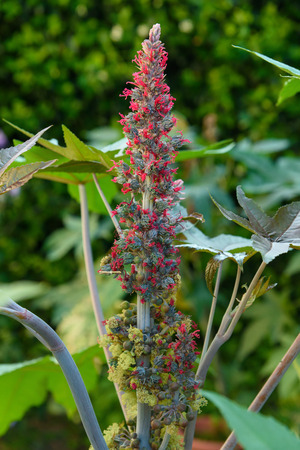 Methanolic extracts of the leaves of Ricinus communis were used in antimicrobial testing against eight pathogenic bacteria in rats and showed antimicrobial properties. The pericarp of Ricinus showed central nervous system effects in mice at low doses. At high doses mice quickly died. A water extract of the root bark showed analgesic activity in rats. Antihistamine and anti-inflammatory properties were found in ethanolic extract of Ricinus communis root bark.